For some ministry leaders in GNJ, the mission of IGNITE isn’t just to reach young people but rather the exact opposite. A nuanced perspective that’s beginning to grow in GNJ is the idea of seeing IGNITE through the lens of mission and outreach in an effort to embolden an older generation to become active in seeking to further the ministry of the next. Rev. Gina Yeske, GNJ’s new Director of Small Groups and Senior Pastor at Simply Grace UMC in Bloomsbury, is one of them. In 2014 and 2016, Yeske brought groups of students to IGNITE that included members of the church’s youth group as well as students from the surrounding community. For Yeske, IGNITE was more about reaching the community and growing her youth group by using IGNITE as an outreach vehicle. Creative, out-of-the-box thinking has engulfed IGNITE, which over the last two years has transformed from an annual youth weekend in Ocean City to an experience and movement in Wildwood. Rev. Shelley Smith, Senior Pastor of Ferry Ave UMC in Camden recalls the exciting opportunities youth events and outreaches provided her growing up and the value she placed upon those unique life-altering experiences. When the first IGNITE conference debuted, Ferry Ave’s youth group was just getting started as a part of the Camden Urban Ministry Initiative (CUMI) which is made up of six United Methodist Churches. “The initiative joins us together to allow our youth to take part in IGNITE,” said Smith. “The students who came out experienced something new and different and caught a glimpse of the bigger picture of what being a part of a youth group in GNJ looks like.” Smith explained that the students at Ferry Ave returned from IGNITE inspired and wrote essays about their experience. 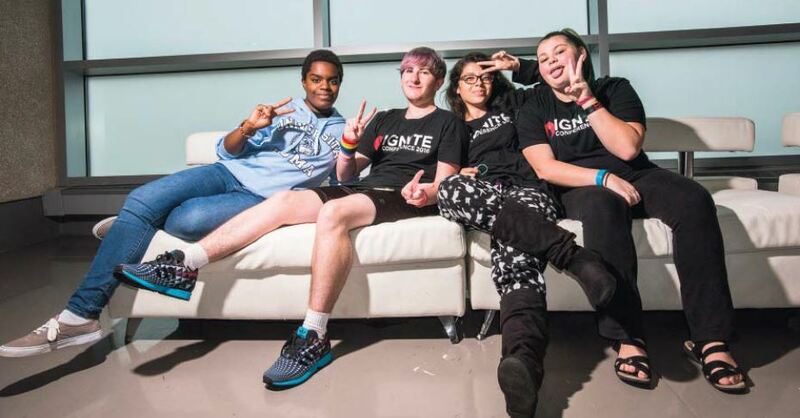 Smith believes young people are the best suited to connect with other youth, so she encourages adults to empower them to invite their friends, establish scholarships and create street teams centered around IGNITE. “Over the past three years, the excitement and energy of IGNITE has recalled for me the kind of excitement and energy I experienced as a young person in our camping program at Aldersgate,” said Skylands District Superintendent Steven Bechtold. “It was something that was encouraged by a Christian educator in my home church who encouraged and supported my participating in those experiences.” Bechtold explained how those programs allowed him to connect with youth from other congregations, develop a new sense of what it meant to be in community with others and become friends with people whose experiences and backgrounds were different from his own. Other congregations, including some without youth groups, are catching on to the idea of seeing IGNITE as a mission project by providing scholarships for GNJ youth and or street teams to reach out to the local community. Some churches like Oasis UMC in Pleasantville brought a blend of students from the church’s youth group and the neighborhood to IGNITE. The church’s Senior Pastor, Rev. Amarilys Gonzalez-Lopez, was inspired by the high spirited ministry centered around IGNITE. Palisades District Superintendent Gina Kim was “delighted” to take part in last year’s IGNITE conference. She link’s the success of IGNITE with GNJ’s Next Generation initiative that was passed at this year’s Annual Conference. Smith encourages GNJ youth pastors to do exactly that by setting goals for their youth, encouraging them to invite their friends and sharing stories with the congregation through social media, church newsletters and announcements.